» 5 Best Gun Oils [WITH PROS AND CONS]. One of the first things I learned about owning a gun is how to properly maintain it. I want my firearms to be there for me when I need them the most. That’s why I make sure to use a high quality gun oil or lube every time I clean my firearm. With so many different brands of gun oils and lubes out on the market, it’s hard to know which one to buy. One piece of advice is to stick with the more well-known brands that have been around for a while. Lucas Oil 10006 Gun Oil - 2 oz. I reviewed the five best gun oil and lubes, giving you the pros and cons of each so you can decide for yourself which gun oil or lube fits best with your firearm needs. Read on to find out more about what it takes to keep your gun in good working order for years to come. Here I give some advice on good reasons to lubricate and protect your gun, what the difference between gun oil and grease is, and a few other handy tips. Guns can be pretty tough, but they have their limits. For example, metal and wood parts need to be protected from friction, the elements, the weather and from the acidic effect of human skin oil and sweat. None of these factors will necessarily destroy a firearm at once, but over time, without proper lubrication, your firearm can rust, jam up, freeze, overheat, collect residue, and the metal parts can corrode. Even when a gun is put away in storage for a few years or even decades, it can oxidize over time. 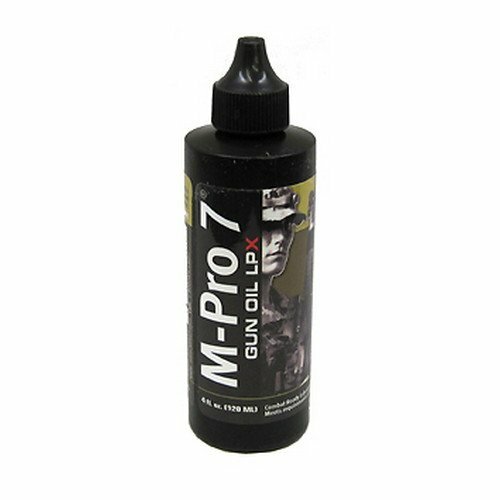 A proper gun lube can keep your firearm in working condition, so it can be used whenever you need it most. There are a lot of factors to keep in mind when deciding whether to choose gun oil or gun grease, also known as lube. The difference between gun oil and grease is in its viscosity, that is, how thick or thin the gun lubricant is. When I plan to use my guns in an extremely hot or humid climate, such as a desert or jungle, I always go for the grease (lube). It can stand up to high heat and humidity without drying out or running. You don’t want your oil to leak because it can pick up other stuff like powder, dust, and sand. Another reason I use gun lube is for heavy artillery such as machine guns and assault rifles. These pack a really hot punch, and I like to make sure that I have the right lubrication that can withstand really high heat before I take them to the range. See my review below for my favorite heat-resistant gun lube. On the other hand, when I am in an extremely cold environment with sub-freezing temperatures and lots of snow, gun oil is what I use. It goes on more easily than thick oil because it is more fluid and won’t rub off as easily. It’s also pretty easy to reapply, especially if it comes in an aerosol can. Even the best of gun oils and lubes need to be cleaned sometimes. Eventually, every gun oil and lube will attract powder, dust and grime which can affect the proper functioning of your firearm. I usually check with the gun manufacturer to see which cleaning product to use before applying a new coat of gun oil or lube. Be sure not to overlubricate your firearm, as it can lead to gumming up of oil in your gun. I use oil for moving parts that turn and reciprocate. I use grease for gun parts that use a sliding action. While gun lube can protect from rust, oil is a better solution because it doesn’t become gummy or collect particles such as dust, grime, or powder. Tetra gun grease comes in a small tube with an applicator. It is a heavy-duty synthetic gun lubricant that works on a wide variety of firearms. It is a fluoropolymer white grease that works well on a wide range of temperatures. Hoppes is one of the better known gun oils. The synthetic blend is a breakaway product from their original oil, and the synthetic blend was designed especially for modern firearms. It’s also an improvement from the original oil in that they took away the bad odor the original oil was known for. The synthetic blend is completely odorless, so it’s one less thing to deal with when you are cleaning your firearm. You can also use it on other sporting goods such as fishing reels. Made proudly in the USA. This gun oil is a combination of synthetic oils and lox additives. It can help a gun withstand the effects of saltwater, humidity and moisture, making it really effective against corrosion of any kind. It can withstand high heat and has a long shelf life. It also actively repels dirt, grime, and powder from hard-to-reach places. Lucas gun oil was made specifically for guns that have high heat such as machine guns and high caliber rifles, as it can withstand very high temperatures. It can also be used on fishing reels and household materials. It is completely odorless and resistant to moisture. Lucas gun oil is a great option for storage because it resists drying and evaporation. Ballistol was developed by a German scientist for the German army as an all-in-one solution to clean, lubricate, protect and preserve firearms, their gun stocks, and leather gear. Its many uses have become legendary, almost mythical. They range anywhere from polishing brass, shining shoes to emergency disinfectant for wounds. A couple of caveats with this product. It has a bad smell that lots of consumers complain about. Also, check to make sure you are ordering the right size of Ballistol. There is only a small difference in price between the really small, almost sample-size version and the regular size. A lot of people accidentally order the sample size and are really disappointed. Buyer beware.